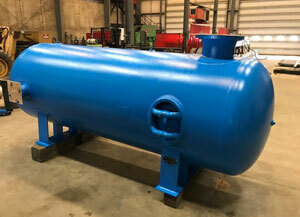 New England Mechanical Overlay specializes in ASME boilers and pressure vessels of all types. Whether your need is to purchase, design & build, repair, installation or maintenance of power boilers. NEMO has you covered. NEMO is backed by the experience, knowledge and ASME stamps required to perform safe and high quality repairs on your boiler or pressure vessels. 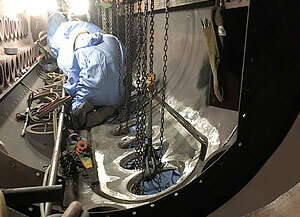 New England Mechanical Overlay specializes in ASME boilers and pressure vessels of all types. Whether your need is to purchase, design & build, repair, installation or maintenance, NEMO has you covered. The NEMO is backed by the experience, the knowledge and ASME stamps required to perform safe and high quality repairs on your boiler or pressure vessels. New England Mechanical Overlay services all aspects of piping and piping accessories including both power and process piping. NEMO can repair or extend the life of process piping (that has been compromised over time by the pressurized flow of gas or liquids) by applying overlay using a variety of techniques and materials. The NEMO Fab Shop can fabricate piping, joints, and any neccessary components needed to complete the project. New England Mechanical Overlay has served the Power Plant industry for years and is proficient at providing safe repairs, upgrades and installations during outages. NEMO’s road crew can respond quickly with the manpower and tools to get your plant back up and running in a safe and timely manner and with minimal downtime. 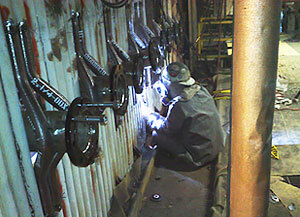 New England Mechanical Overlay specializes in repairing and maintaining both power and industrial plants. Our team will ensure that the repairs are made with as little downtime as possible and with an unmatched standard of safety. NEMO is an ASME stamp holder. To ensure the future reliability of your equipment, NEMO’s sister company Hardvard NDE can perform scheduled boiler inspections and UT profiles to provide you with a roadmap to proactive maintenance. Stay ahead of the game and experience better uptime, a safer facility, and cost savings over time. Our name says it all. New England Mechanical Overlay has been providing overlay welding services for a wide variety of industries since 2005. NEMO’s overlay or clad welding utilizes a variety of techniques, such as weld-metal-build-up, and a variety of corrosion resistant metals (carbon, steel, inconel, and more) to protect your pipes, tubing, valves, fittings, and pressure vessels. 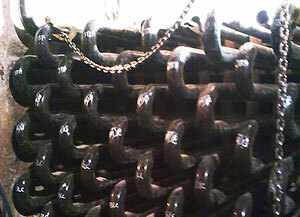 Economizers provide a unique challenge to repair and maintain due to the many bends and turns in the coils. 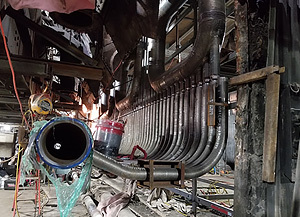 New England Mechanical Overlay’s welders are experienced, trained, and tested in mirror welding and consider working in the most unusual and physically challenging locations a typical day on the job. We’re used to working under pressure. New England Mechanical Overlay has been installing, repairing and maintaining superheaters since 2005. 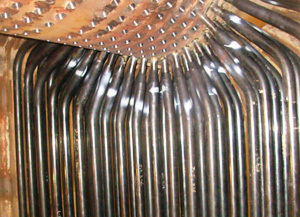 Our team of certified welding experts will ensure that your superheater is running optimally. Pieces and parts can be repaired onsite or fabricated in our 6,000+ NEMO Fabrication Shop. 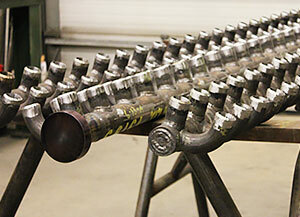 Water wall tubing provides a unique challenge for even the most experienced welder. NEMO’s welders are experienced in-the-field and technically trained to perform high quality repairs and maintenance to your power boiler. 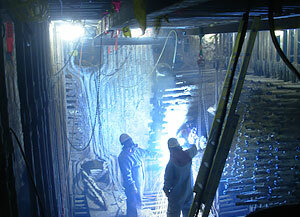 Industrial process air heater installation, repair and maintenance is provided by New England Mechanical Overlay. 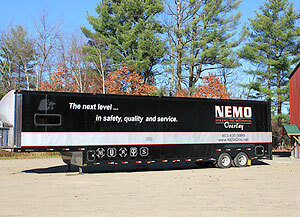 Work can be completed onsite via NEMO’s road crew or in NEMO’s custom fabrication shop. 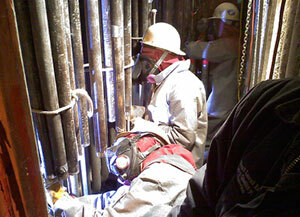 New England Mechanical Overlay’s boilermakers are leaders in generator tube installation. Experience in both welded and tube connections, NEMO’s boilermakers will repair your generator on location with fabrication support from The NEMO Fab Shop. 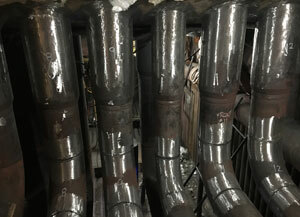 New England Mechanical Overlay performs quality work supported by qualified welders when it comes to working on headers. If the headers cannot be repaired in the field, NEMO’s Fab Shop can get the work completed at their Pittsfield, NH location. New England Mechanical Overlay services all aspects of a power boiler from the inside to the outside. 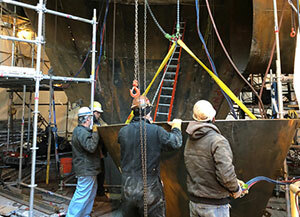 Baghouse installation, maintenance, and custom fabrication is a service provided by NEMO. 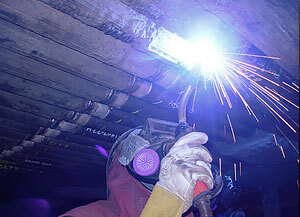 Fabrication can include process components or exterior mechanical requirements, such as stairs and platforms. If power boiler alterations are needed, NEMO is able to design and create fabrication drawings that meet your unique requirements and certifications along with supporting calculations and material specs. The alterations can be fabricated from scratch at NEMO’s Fab Shop or in the field. NEMO’s road crew travels with a customized, fully-stocked, tractor-trailer preloaded with your project specifications in mind. The high standard of safety that you expect from New England Mechanical Overlay includes a thorough test of your drum by their certified NDE inspector. If your drum requires repairs or maintenance, NEMO’s team of expert welders can get your boiler back up and running with little downtime.